Order tickets online for discounts. June-August is winter in Brisbane. Temperatures can be quite cool. Order tickets online. Opt for public transportation vs. ferry. 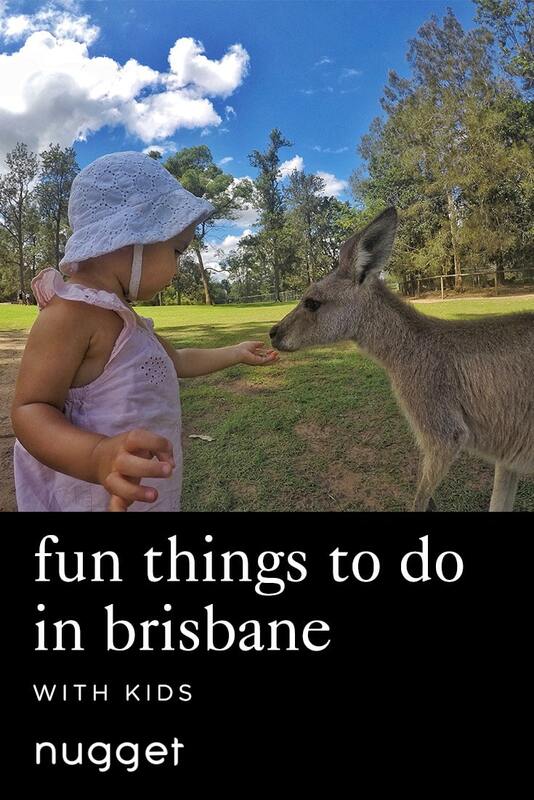 This itinerary is filled with fun things for kids to do in Brisbane. Spend a family-friendly day exploring Australia’s famous wildlife at the Lone Pine Koala Sanctuary. They will love petting and feeding the kangaroos, watching a platypus swim and getting pictures taken with a friendly koala. After the Sanctuary, head to South Bank Parklands for some water playtime in the many pools and lagoons at Streets Beach. For even more kid-friendly activities stop at The Riverside Green Playground. The perfect spot for letting the kids run around. The world’s first and largest koala sanctuary, Lone Pine Koala Sanctuary is the perfect place to spend time with the whole family. There are more than over 100 Australian animal species, including more than 130 koalas and. Children can hand-feed kangaroos and have lots of opportunities to interact with many of the animals. There are also many informative presentations and shows throughout the day. Finally, don’t miss getting your picture with a cuddly koala. There is also free wifi throughout the park, along with a bloggers area with comfy seating and charging stations for mobile devices. A large central cafe has a variety of dining options and includes a play area for kids. DIRECTIONS If you stay in the city center, you have a few options. The cheapest way is by bus. Queen Street Station is the main stop, located underneath the Queen Street Mall. Bus 430 departs from platform 2C. Ticket prices are A$3.90 and the trip takes about 45 minutes. A more scenic option, the Mirimar boat cruise leaves the Cultural Centre Pontoon in South Bank at 10 a.m. daily. The pontoon is located on the boardwalk outside of the State Library. Journey time is about 75 minute and arrives at Lone Pine at around 11:15 a.m. and departs for the city at 2:15 p.m. Tickets can be bought for the round-trip journey and admission: A$75 for adults and A$40 for kids. Then there is Uber, which quoted a journey time of 20 minutes and between A$21-A$29. TIP Look up show times ahead of time to help plan your day. Print off tickets beforehand, as there were two lines when we arrived - one for tickets and one for purchasing on arrival, which was quite long. South Bank Parklands is a family-friendly recreational and cultural destination. It has more than 17 hectares (42 acres) of parklands, dozens of world-class dining options, free events and gorgeous views of Brisbane. The main attraction is the Streets Beach, a man-made lagoon-style swimming beach. Streets Beach has plenty of sand in which to soak up some rays and plenty of shallow areas for the kids. Once the little ones get tired of swimming, head to the award winning Riverside Green Playground, a huge play area complete with slides, skywalks and tunnels. Nearby, the 60-meter (197-foot) Wheel of Brisbane offers 10-minute rides with amazing views. Close to that, the "BRISBANE" sign is where to get a family photo with the city skyline in the background. For dinner, head to the Stanley Street Plaza where options range from cafes and pubs to street stalls and high-end restaurants. DIRECTIONS After your morning at Lone Pine Koala Sanctuary take the bus or boat back to the city center. From the city center, it is a quick 15-minute walk to South Bank. Head towards the Brisbane River and cross over the Victoria Bridge. After crossing the bridge turn left and head south, passing the Queensland Performing Arts Centre. It will be hard to miss as the wheel of Brisbane towers above the park. TIP Bring a change of clothes for after your day at the beach. Large and clean changing rooms are available. Lifeguards are present throughout the day. If you happen to be there from Friday to Sunday, be sure to check out the Collective Markets, a buzzing market selling jewelry, clothing, and gifts. There are also street performances and live music that will entertain your entire family. WE LOVEDApartment style rooms with convenience of a hotel in the city center. WE DIDN'T LIKESmall swimming pool. TIPSupermarkets nearby to prepare meals.